Inspired by classic European preserves, Audra Lawlor's concentrated "jams" can be served by the slice. 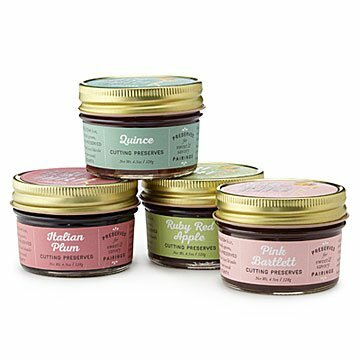 Audra Lawlor's intensely flavorful preserves are inspired by a classic Spanish quince paste called dulce de membrillo. Rarely seen in the US, this type of highly concentrated "jam" has a dense consistency you can cut with a knife, just like the cheese you pair it with. Audra uses only single varietal fruits from local heirloom orchard trees, some over a century old. Using a classic French method, she and her team cook them in copper pots with no added water, to concentrate their flavor. Homegrown herbs complement each of the four preserves, which are particularly tailored for cheese pairings, but also make delicious additions to sauces, glazes, and vinaigrettes. Handmade on Orcas Island, Washington. A Pacific Northwest native, Audra Lawlor left a career in finance in New York City to return home with her husband. The couple settled on Orcas Island, and Audra, inspired by the island's natural beauty and legacy of orchard keeping, began gardening and creating her own preserves, made from local fruits and informed by her travels abroad. She's been crafting all-natural, island-sourced products ever since, with an approach simultaneously creative and devoted to traditional, time-intensive techniques.